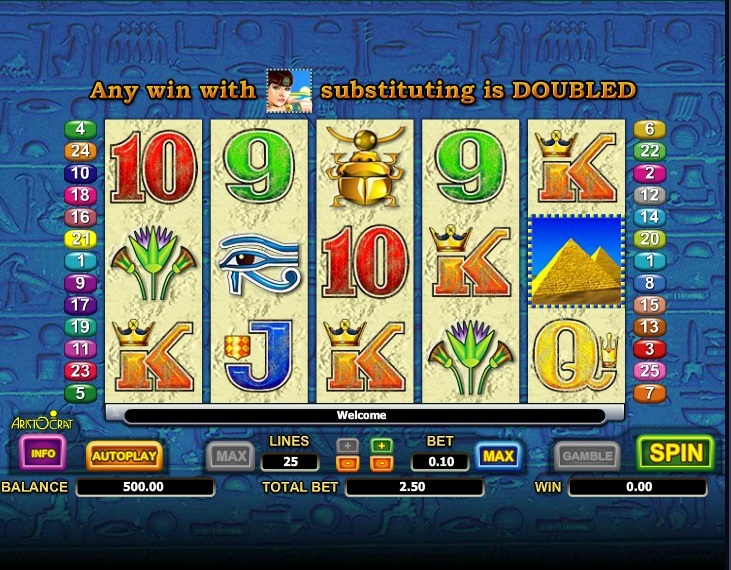 As you can tell from the title, this is the second Queen of the Nile slot machine that is released by Aristocrat. They’ve made some improvements in this version of the game, but not when it comes to the design, which remains the same for the most part. The features are the ones that are a bit more exciting right now, but the top prizes are lower as well unfortunately. 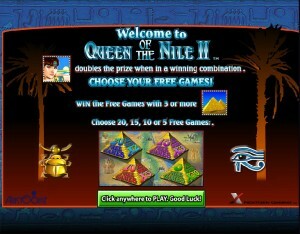 25 bet lines are available in Queen of the Nile 2, a 5 reel slot machine. Free games with multipliers of up to 10x are available, plus scatter symbols and wilds (also with multipliers). Overall, a decent spread of features, with payouts of up to $12,000. If you want great features from your games, Queen of the Nile 2 will be a good choice, offering wild symbols with multipliers, scatter symbols and multiple types of free spins to choose from, each one with a different multiplier (up to 10x). The wild Queen, as naughty as that might sound, is a pretty typical wild. It’s a symbol which is capable of forming its own combinations if the conditions are met, awarding up to 3,000x, but it’s also going to substitute for other symbols and will assist them in forming their own combos. The wild also has a 2x multiplier, and you can see on the paytable both the regular payouts and the amount you can win when this feature assists. 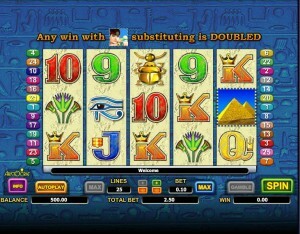 Just like in the previous game, the Pyramids are in the scatter symbol and they can trigger free spins and award prizes. The payouts are much smaller now, going only up to 100 times the bet. The biggest improvement of the game was done in the free games section, where you get to choose how many you get, the multiplier changing based on that. 3 or more scattered Pyramid symbols are needed to get this feature active. Once it does trigger, you will have four options to choose from. The first one gives you only 5 free spins, but the multipliers for all wins will be at 10x. The second option has 10 free spins and 5x multipliers. Next, 15 free spins and 3x multipliers. Finally, there is the option of 20 free spins, but with the smallest multiplier, at 2x. You use the betting options to change the number of lines (from 1 to 25) and the line bet (from $0.02 to $4). You can spend up to $100 on a single spin, no more. With help from the wild symbol, the top payout of 750x becomes a 1,500x jackpot. That’s up to $6,000 cash that you can win. An even better payout comes from the Queen, which gives up to $12,000. There are 10x multipliers possible during free spins, so things could get a lot better. 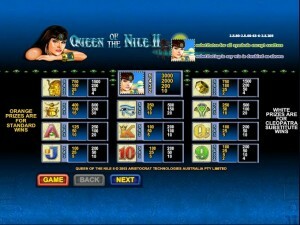 The design of Queen of the Nile 2 is about the same as the one from the first slot of the series. The background image is the only one that has changed, now using a blue wall from inside the pyramids, much more decorated with hieroglyphs than the one from the previous game. The reels have remained the same, and the symbols haven’t changed at all either. Symbols: Queen (3,000 coins, wild), Pyramid (100x bet, scatter), Pharaoh (750 coins), Bracelet (750 coins), Scarab (400 coins), Eye of Ra (250 coins), Flowers (250 coins), Ace (125 coins), King (100 coins), Queen (100 coins), Jack (100 coins), Ten (100 coins) and Nine (100 coins). While the theme choice is a very common one, the 10x multipliers which can be applied during free spins make the game worth considering. I for one will be going back to it and give it a second chance. 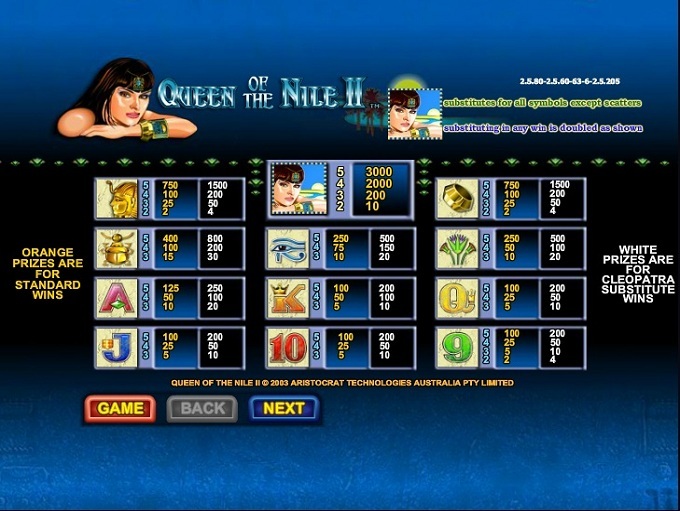 Queen of the Nile 2 can be found at any Aristocrat casino, where you get a chance to play it for real money or in free mode.